It’s no secret that there are a lot of moving parts and issues to consider when remodeling a home today. The first step we suggest taking when considering a remodel is determining your existing home’s style. This is not necessarily an easy task. Sure, some homes are easy to identify: a genuine colonial, Tudor, bungalow, or Cape Cod cottage. However, a large majority of houses are not a classic version of one of the above styles, and many boast various architectural elements from several different styles. Start the process by stepping across the street and truly looking at your house. Observe its shape and size. Consider the pitch of the roof, the placement of the windows and where you enter the home. Do you like the shape, form and function of your house, or do you want to make some dramatic changes? Next, we suggest considering your home’s exterior materials. Do they need renovating, either for aesthetic purposes or for ease of maintenance? Are there some areas you like and some you want to change? You can use the same design-style analysis for the interior of your home, room by room. However, perhaps more important is to carefully analyze your current home to assess what works – and what doesn’t – in terms of the way your house functions, as well as how you and your family live in it. Some clients are perfectly clear about this and often come to us with ideas of exactly what they need. While others can list out problems, but are at a loss for actual solutions. And there also are some clients that know there are issues with their house and know they need help and support. At Republic West Remodeling, our team of professionals is trained to solve these kind of problems, providing remodeling ideas in Phoenix to help you identify what isn’t working about your house and why. Together, we can come up with solutions. It’s important to keep in mind: merely adding a big addition to the back, side or top of the house, does not solve most of the typical space issues in homes. In fact, re-configuring the existing space within the house can dramatically affect the way a house flows and functions, with no addition at all. If additional space is required, we often suggest smaller-size bump-out additions to add three feet here or two feet there, which can dramatically change the function of the space. A small addition can make a huge difference with functionality. Finally, remember to be patient throughout the process. The result can be worth the time, money and stress as you will eventually have a home that supports your family’s lifestyle. 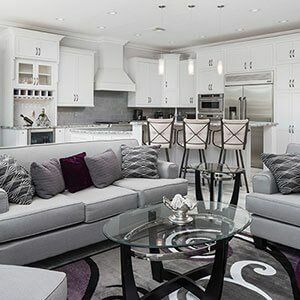 With over 20 years of home remodeling experience in the Phoenix area, we have a team of leading professional home remodeling contractors that can help you realize your dreams. Call Republic West Remodeling today.